The Republican Party held its second national convention beginning at noon on May 16, 1860 in Chicago. The presidential nominees included the veteran statesmen Edward Bates, Salmon P. Chase, Simon Cameron, and William H. Seward, as well as a new senator from Illinois, Abraham Lincoln. Although Seward was the favorite going into the convention and led the nominees on the first two ballots, Lincoln won the Republican presidential candidacy. Republican delegates had looked to back the candidate they felt could generate the most electoral support. Horace Greeley, the editor of the New York Tribune, had the ears of 48 delegates. Greeley’s battle cry was “anyone but Seward!” and initially gave his support to Bates. According to Greeley’s recent biographer Robert Chadwell Williams, as Lincoln began closing in on Seward in the third ballot, Greeley shifted his 48 votes over to Lincoln, giving him the candidacy. This Currier & Ives political cartoon shows Seward drowning of the pier after being pushed in by Greeley (the figure in the top hat). Drawn by Louis Maurer and published in 1860, “Impending Crisis” satirizes the influential role of newspapermen in Civil War-era politics. Henry J. Raymond (in the police uniform), founder of the New York Times, also helped write the charter of the Republican Party in 1856 and later was a New York Representative. James Watson Webb (on the left dressed as a newspaper boy), editor of Courier & Esquirer, recently threw his support behind the Republican Party. The title of the cartoon refers the book written by Hinton Rowan Helper in 1857, The Impending Crisis of the South: How to Meet It, which denounced slavery from an economic viewpoint—slavery prevented a diverse economy, disadvantaging poor Southerners. 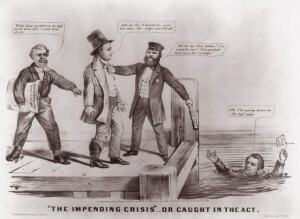 Although Seward is undergoing the crisis of losing the Republican presidential candidacy in this cartoon, he would become Lincoln’s Secretary of State, a member of a cabinet filled with Lincoln’s previous political rivals. I always loved these old political cartoons. Do you know of any books that are purely cartoon from the 1800-1900 era? I’m not sure if there is a book that only catalogues nineteenth-century cartoons, but the Library of Congress published American Political Prints, 1766-1876 (1991) which includes their cartoon collection for a comparable era. The book gives a brief contextual summary as well as the date and place of publication for the political images. Also, the introduction briefly explains the history of American printmaking and also includes a selected bibliography for further research.